An image of the Kyocera Corporation’s existing Kagoshima Nanatsujima power plant in Japan. The company’s new project will be the largest fully-floating solar installation in the world. If you’ve ever been out in a boat on a hot summer day, you know that open water gathers a lot of sun and heat. Engineers in Japan are hoping to harness that power with the construction of what will be the planet’s largest floating solar power installation. Japan’s Kyocera Corporation has already leveraged the power of open water with shoreline solar installations like the fixed Kagoshima Nanatsujima plant, pictured above. The new project, however, will be built around 50,000 solar collection modules actually afloat on the Yakamura Dam reservoir. The modules will cover a water surface area of around 180,000 square meters. Engineers estimate the plant will generate more than 15.6 megawatt hours (MWh) per year. That’s enough to power approximately 4,700 average households. More numbers: According to the company’s projections, the floating power plant will gather enough solar power from the surface of the dam to offset about 7,800 tons of carbon dioxide emissions annually. The facility will also include an education center adjacent to the plant, to provide classes for local students on environmental issues. “When we first started R&D for solar energy in the mid 1970’s, the technology was only viable for small applications such as street lamps, traffic signs and telecommunication stations in mountainous areas,” said Nobuo Kitamura, Kyocera senior executive officer, in press materials for the project. Two crucial tasks exist for realizing high-efficiency polymer solar cells: increasing the range of the spectral absorption of light and efficiently harvesting photo-generated excitons. 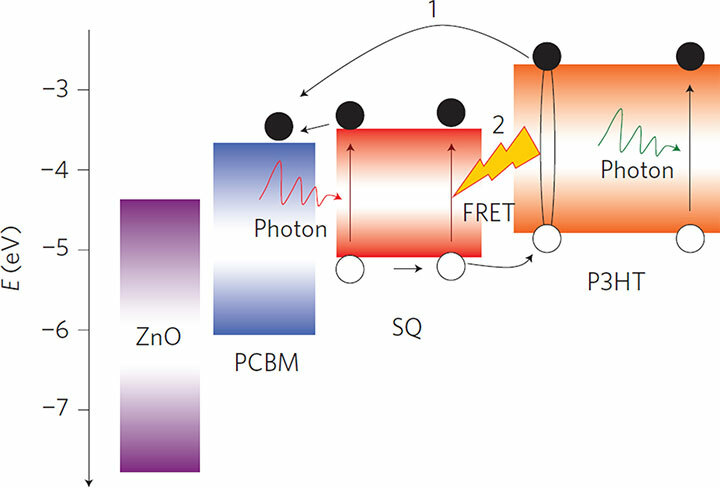 In this work, Förster resonance energy transfer (FRET)-based heterojunction polymer solar cells that incorporate squaraine dye (SQ) were fabricated and investigated. The high absorbance of squaraine in the near-infrared region broadens the spectral absorption of the solar cells and assists in developing an ordered nano-morphology for enhanced charge transport. 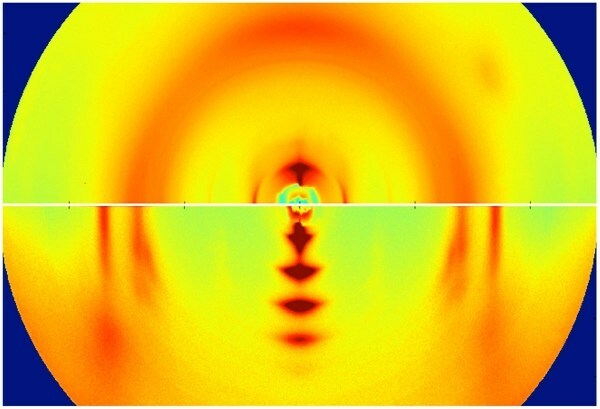 Femtosecond spectroscopic studies revealed highly efficient (up to 96%) excitation energy transfer from poly(3-hexylthiophene), also known as P3HT, to squaraine occurring on a picosecond timescale. A 38% increase in power conversion efficiency was realized to reach 4.5%; this finding suggests that this system has improved exciton migration over long distances. This architecture transcends traditional multiblend systems, allowing multiple donor materials with separate spectral responses to work synergistically, thereby enabling an improvement in light absorption and conversion. This discovery opens up a new avenue for the development of high-efficiency polymer solar cells. Next generation solar panels could yield substantially lower costs per kilowatt-hour with this technological development. A new energy transfer mechanism has been exploited for the first time, allowing significantly more efficient energy harvesting in P3HT/dye solar cells compared to P3HT-alone solar cells. 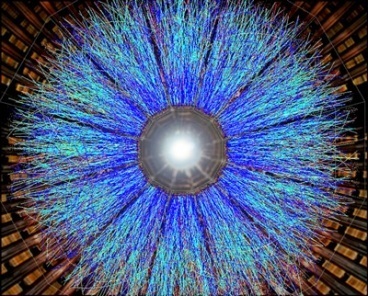 Also, broadening the light absorption spectrum into the near-infrared region and developing nanoscale parts to the solar cell has improved the device. Energy level diagram of the components of the ternary blend solar cell highlighting pathways for charge generation. “Scientists have spent decades trying to build flexible plastic solar cells efficient enough to compete with conventional cells made of silicon. To boost performance, research groups have tried creating new plastic materials that enhance the flow of electricity through the solar cell. 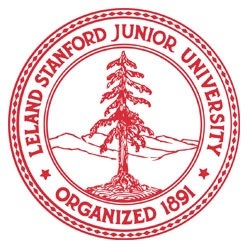 Several groups expected to achieve good results by redesigning pliant polymers of plastic into orderly, silicon-like crystals, but the flow of electricity did not improve. “Bring on the sunshine! April showers are behind us and the sun is shining a little longer each day in the northern hemisphere. 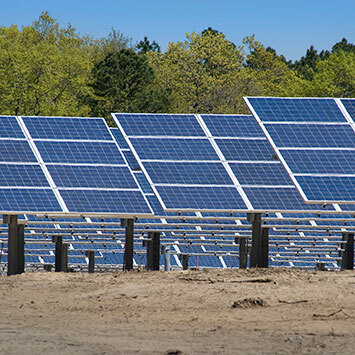 That means the 200-acre Long Island Solar Farm (LISF) at Brookhaven Lab is producing increasing amounts of renewable energy for Long Islanders and data for our researchers. 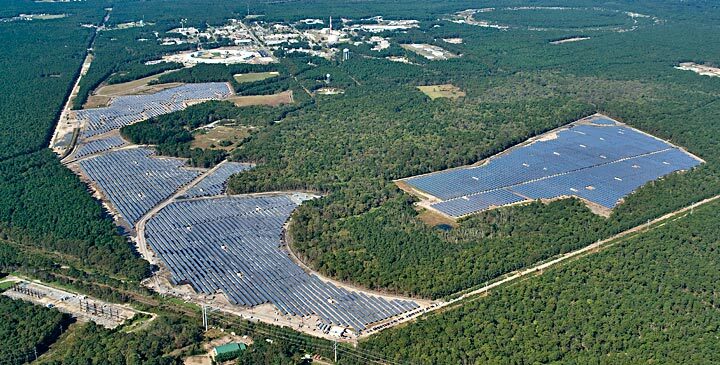 The 200-acre Long Island Solar Farm (LISF) is located at the east end of Brookhaven Lab. By hosting the LISF and future Northeast Solar Energy Research Center on site, Brookhaven Lab has positioned itself at the forefront of new research to help develop real-world solar energy technologies. The LISF is the largest solar array in the eastern U.S. and is located at the east end of the Lab site. It contains 164,312 photovoltaic panels grouped and mounted onto more than 6,800 racks. The LISF can produce peak power output of 32 megawatts (MW) of alternating current that powers homes and businesses. Operations began in November 2011, and during its first 12 months, the LISF produced a total of about 54,000 megawatt-hours (MWH) of energy. That’s 23 percent more than the design estimates for 44,000 MWH, which is equivalent to the power usage for about 4,500 homes. See the full and very enlightening article here.